You can order the script Charlie and the Chocolate Factory from Amazon HERE and the original book can be ordered HERE. Since 2005, University Scholastic League (UIL) Theatre has had Theatrical Design throughout the state of Texas. This is a competition where technical theatre students can show their skills as designers and compete against other students in their conference to get to the state level where they will have their work critiqued by some of the top designers in the state. Students can design costumes, makeup, set, or marketing. They can compete individually in a design area or as a team with one driving concept that connects all four tech areas together. What is the subject of design? 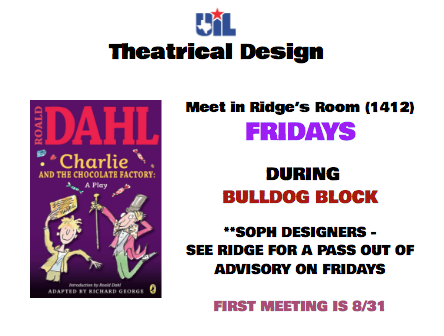 Each year UIL Theatrical Design chooses a show and a director's concept that designers base their ideas off of. 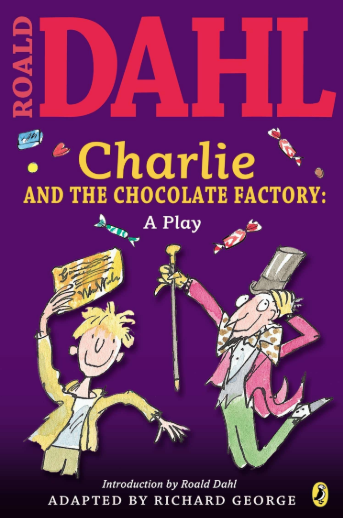 This year's play is, Charlie and the Chocolate Factory by Roald Dahl (adapted for the stage by Richard George). This is NOT the musical but the children's show. The director's concept can be read HERE. Students at Magnolia High School will meet Fridays during Bulldog Block to prepare for our entries into this fantastic opportunity. Check back here or on our calllboard located across from the Black Box at MHS for updates and email Mrs. Ridge at cridge@magnoliaisd.org with any questions you may have. You can order the script Charlie and the Chocolate Factory from Amazon HERE and the original book can be ordered HERE. We're excited to bring this opportunity to the creative and hard working students of Magnolia Theatre!